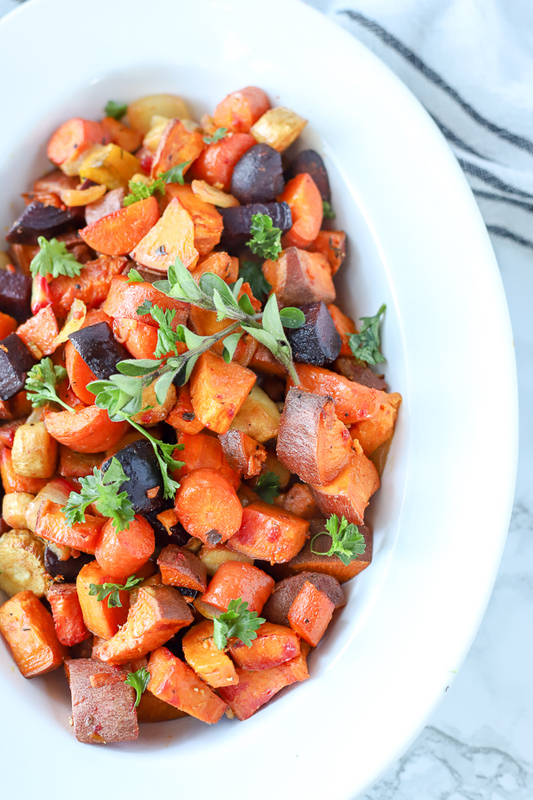 Healthy and colorful roasted root vegetables make the perfect side dish all year long. 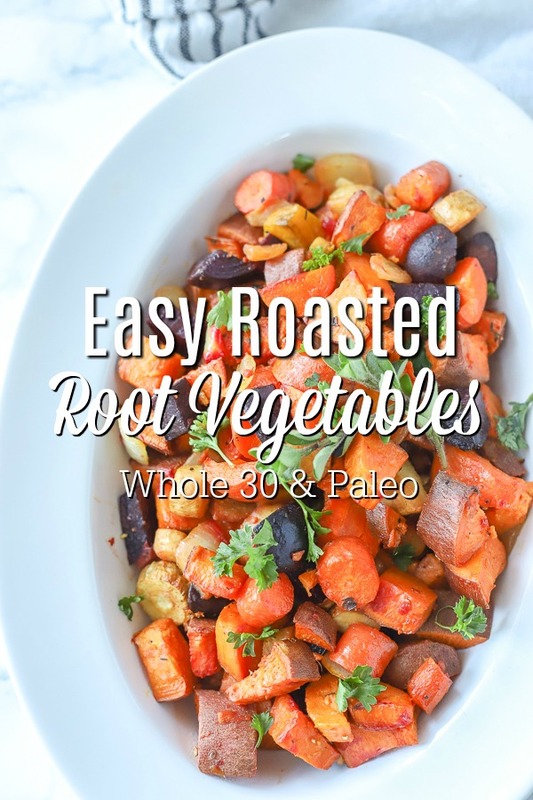 This roasted root vegetable recipe combines simple, real-food ingredients to make a hearty side dish. Follow my tips below when making this delicious recipe. Spring has officially arrived, and for some reason my body craves two things in spring…. root veggies and greens. It’s the only time of year that I crave salad, but this post is not about that. Move over salad, root vegetables are in town, and boy, are they delicious! I love how roasting really brings out their sweetness. For this recipe, I decided to try a few veggies we don’t normally eat, like beets (we usually only eat them in this berry beet smoothie), and try a new vegetable I don’t think my kids have ever tried: parsnips. It was so fun to watch the kids eat them. I truly believe that if we are good examples and give our kids a variety of foods without pressure, they will be great eaters. So far, our kids are amazing eaters. There are very few foods they refuse to eat, and even if they do refuse to eat them, it is no big deal. I continue to offer them in hopes they will try them one day. Me: “Umm I think so, but it’s hard to tell. That’s okay, though. You don’t have to like everything.” And she moves on. We will continue to make them, and maybe one day she will like them. It only took my brother 25 years to start liking vegetables, but now he eats ones I’ve never even heard of. So all those parents out there struggling to get your kids to eat all the vegetables, don’t worry! It may happen one day. Maybe in 25 years. Root vegetables are full of nutrients. I love the variety of color these vegetables have, from orange, to white, to purple. All that color adds a lot of nutritional benefits and antioxidants. 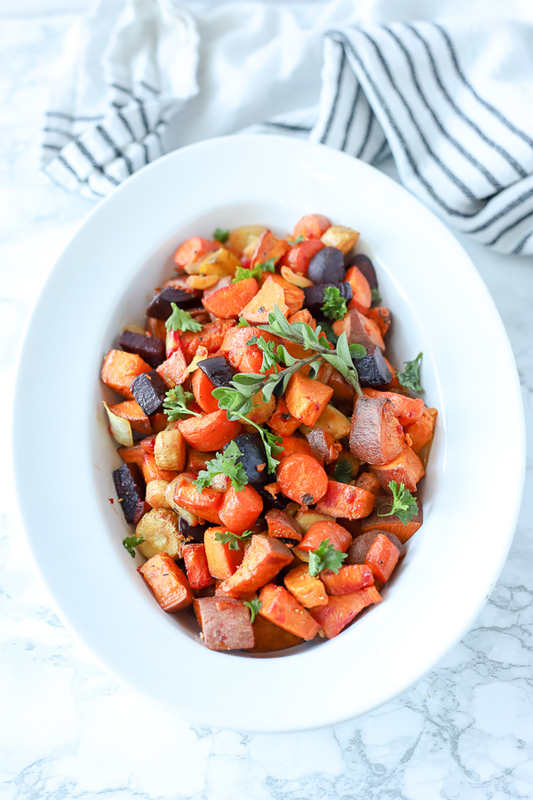 Root vegetables, like sweet potatoes, have vitamin c, vitamin A, potassium, manganese, of course fiber, and many more nutrients and benefits! 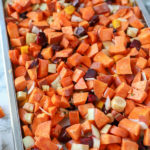 Sweet potatoes – you can use sweet potatoes, white potatoes, or both. Carrots – use orange, or add more color by getting the rainbow ones. Parsnips – or just use more carrots. Beets – omit if you hate them, but they are really delicious in this recipe and I’m not normally the biggest fan of them. You can pick and choose your favorite root vegetables. If you don’t like beets than leave them out. Despise carrots? Forget about them. 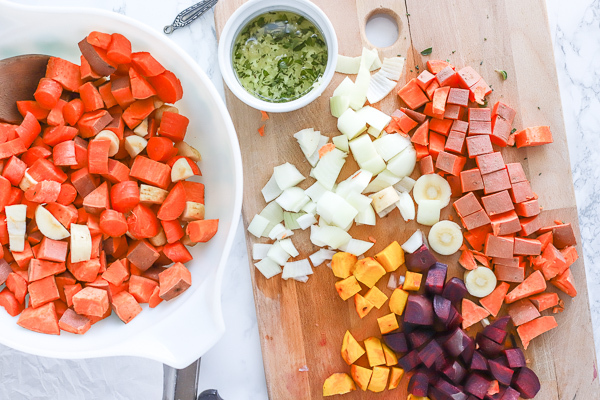 If you want to prepare ahead of time, you can chop the veggies the night before and store them in the fridge. Mix the garlic, oil, and spices in a separate bowl to help disperse the seasonings more evenly. Use fresh herbs for a more fresh flavor, but if you don’t have any available you can substitute dried herbs. Sheet pan, large bowl, sharp knife, parchment paper, measuring cups and spoons, and cutting board. 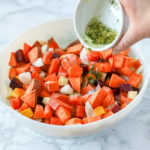 How do I make roasted root vegetables? In a small bowl, add in garlic, oil, and chopped fresh herbs. Chop root veggies and add to a large bowl. Pour garlic, oil, and herb mixture over the veggies. Line a baking sheet with parchment paper and pour vegetables on top. Bake for 50-60 minutes, tossing the mixture once or twice. If you want to get a more caramelized flavor after the veggies have cooked through, then you can place the sheet pan under the broiler for 2-5 minutes, watching closely so that it doesn’t burn. 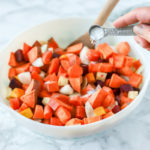 Do you peel root vegetables before roasting? Some root vegetables are good to peel, like ones that have a tough skin. Beets can have a bitter skin, so peeling the skin can help tone down the flavor. I only peel beets if they have really gross-looking parts. Carrots, potatoes, parsnips, etc don’t have to be peeled. There are lots of nutrients in the skin of many of the vegetables, so I prefer to keep them on if I can. If you don’t like them, then peel them. Make sure to wash any of the veggies you plan to keep the skin on well to remove any dirt. Can you roast veggies ahead of time? Yes! Roast them a few hours before, or the day before. Reheat them in a 400 degree oven for about 15 minutes or so. You can also reheat them on the stove top with a few tbs of oil for 10-15 minutes. Blogging is a weird profession and recipes need to made during the day to take photos for optimal lighting. So I made this during nap time, placed it in the fridge, and then recooked it with some chicken sausage. It was delicious. Everyone in my family gobbled it up. How long will roast veggies last in the fridge? Cooked vegetables will last about 3-4 days in the fridge. For best results, reheat them in the oven or on the stovetop. You can reheat them in the microwave, but I like the texture and flavor of the other cooing ways. What vegetables can you prepare the night before? You can slice up carrots and parsnips and place them in clean water in the fridge. Dice up the onion and place covered in the fridge. Don’t peel potatoes the day before. 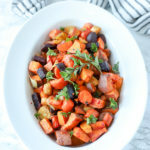 Love healthy side dishes? 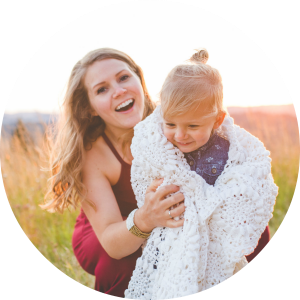 Check out some of our favorite! Golden Butternut Squash Rice is super simple and takes just a few minutes to throw together because of a secret ingredient. We love this simple Sourdough Skillet Bread. If you want delicious bread without waiting hours, then you have to check out this flavorful recipe. Rosemary Spelt Rolls – this has become a staple, and is a well-loved recipe to many. Butter Basil And Walnut Brussels Sprouts is a delicious way to eat Brussels sprouts. 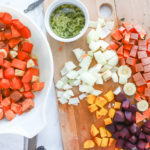 This recipe for roasted root vegetables combines simple, real-food ingredients to make a delicious and healthy side dish. If you give this recipe a try and love it, please make sure to come back, comment, and give it 5 stars! 1-2 tsp fresh herbs oregano, rosemary, thyme, parsley, etc. If you want to get a more caramelized flavor after the veggies have cooked through than you can place under the broil for 2-5 minutes watching closely that it doesn't burn.